“It’s not the clothes that make the...” — the last word of this aphorism is usually “man”, but could equally be “candy”. 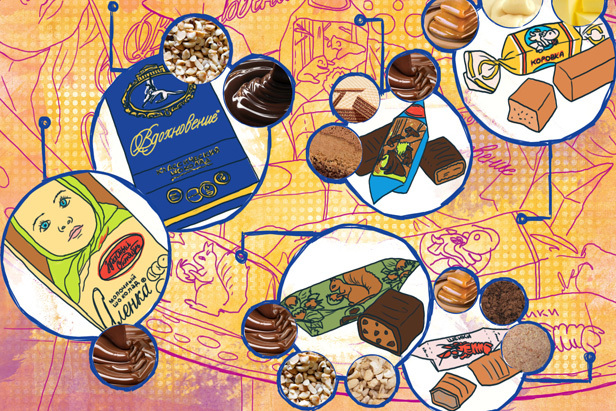 Our picture shows the inside and out of Russians’ most beloved sweets. Confectionery production could be jokingly called Russia’s national idea; No matter what upheavals the country was going through – wars, revolutions, rampant inflation – production of candies never stopped. In the 19th century, all types of candy and chocolate were nameless. Chocolate was designated by number and packed in foil. Consumers distinguished the different sorts either by their number or the color of the foil. The same with sweets. They were described as praline — a mix of crushed almonds with sugar with cacao butter. It was a filling in between two crispy wafers covered with chocolate. One of the oldest sweets with a name and company label was “Mishka the Bear”.